3. Unconsolidated materials like garbage bumps or sanitary landfill etc. In the previous couple of posts I have discussed many problems of foundation on black cotton soil as well other expansive soil and also their remedies and distribution of such soils in united states and India. In this post I shall discuss displaced soil effects. As foundations are placed below ground level, it displace some soil mass. 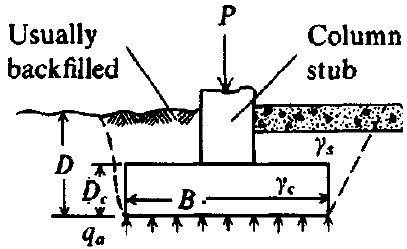 When spread footing are used the displaced amount are summation of the footing weight and the column that rested on footing. Where basement is required for parking facilities, the basement slab is generally rested on top of the footing pad directly. Sometimes holes are excavated through the slab to provide footing and column and then the holes are backfilled to the ground surface. In case of steel columns to avoid corrosion concrete pedestals is provided up to ground and in case of concrete columns, at the footing level it is attached to footing with dowels. If the floor slab is rested directly on ground, careful selection of backfill soil and compaction method is required. The backfill soil that is placed around the basement wall should have free draining property and where required a perimeter drainage system is installed to control hydrostatic pressure.